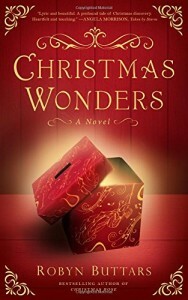 When I first opened my package holding Christmas Wonders, I was awed by the beauty of the book cover. I knew the contents would be just as lovely. Woven within feelings of sadness, loneliness, and curiosity, Robyn Buttars creates a touching and tender story of friendship, community, family and personal growth. It is a simple, short book, but the light and heart it exudes will bring tears to your eyes. Christmas Wonders is told from the perspective of a 9-year-old boy named Luke, who has just moved to town with his father. They live in the apartment behind the cobbler shop, where his father is employed. While his father remains distant and often bitter, Luke works through his initial fears and insecurities to become a good friend and neighbor to all. As he experiences the wonders of Christmas for the first time, he touches the hearts of those around him, and helps them feel the love of Christ and experience the true spirit of Christmas. Luke’s search to find the girl named Lina who created Christmas wonders will entrance you, and make you wish you lived in that town and that you had also been touched by her goodness. Christmas Wonders would make a fine addition to anyone’s bookshelf. It would be a great Christmas gift.